When we got to the movie theater she was a little surprised and tried to tell us it wasn't the theater since it wasn't the one I'd taken her to before but we reassured her it was just a different one. She was so excited about seeing the movie and that Grandma and Grandpa were with us that she couldn't stand still! From her experiences at the free movies she was familiar with the popcorn that goes with the whole movie experience so of course we got a bucket to share! 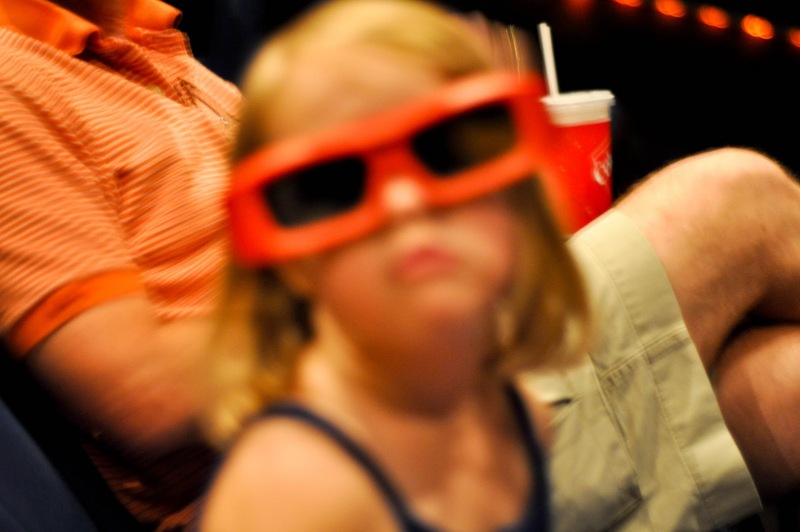 With the movie time we choose we ended up seeing the real-3D version of the movie so we all got cool glasses to wear. (Please excuse the poor quality of the picture - it was taken without a flash in the dark theater which is not the best combination but I didn't want to set the flash off in the theater) Abby ended up watching most of the movie without the glasses though. Abby really enjoyed the movie and sat still with her eyes glued to the movie the whole time. Last summer during the free movies she only lasted about an hour until she had to potty and then wanted to leave. She was certainly all smiles before, during and after the movie!